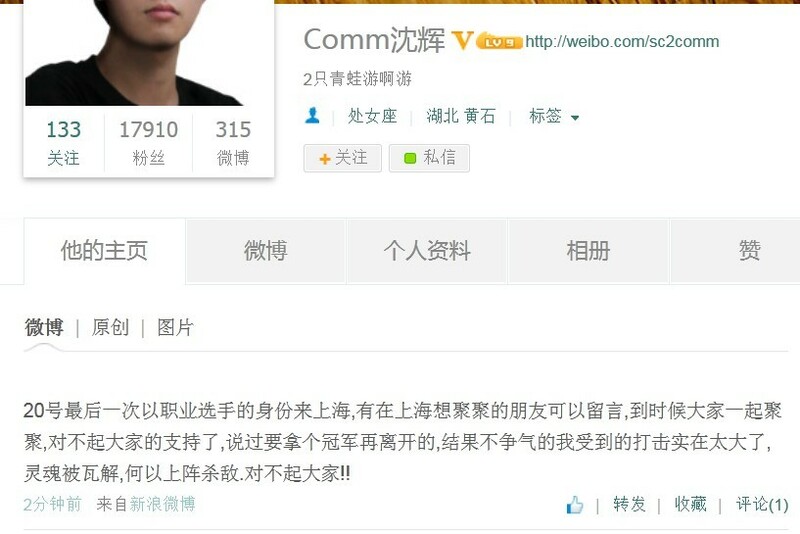 Twenty-four year old Chinese Zerg pro-gamer Shen "Comm" Hui today officially announced his retirement on his social network, after losing to XiGua at WCG China Finals last weekend. "Heading to Shanghai the last time as a pro on 20th, if you want to hang out leave me a message. Sorry for all your support. I promised to leave with a championship title but it was too much a blow for me. I've lost my soul to fight on the battleground, sorry all!" Comm is known for his aggressive play style and unorthodox strategies, his biggest achievement was winning WCS 2012 China Nationals and participating in 2012 Battle.Net World Championship. Besides Comm retiring, his team, Vici Gaming, is also undergoing a change in its RTS division as Comm's former teammate in Wayi Spider, Zhang "Ash" Jin Yue also retired into manager role of VG's League of Legends squad, leaving only Infi and Ted on its RTS squad, according to General Manager of Vici Gaming Lu "HunteR" Wen Jun. Comm is a nice guy. damn. the dude lost his soul! Xigua's soul-crushing zerg play is killing eSports! He needs to switch to protoss to recharge his soul! Choo choo! Pretty sure Comm is a Protoss. Not Zerg. Pretty sure Comm is a Zerg, not a Protoss. Shame. Best of luck to him. Don't blame Blizzard on this one, BLAME DEATH DYING KILL MURDER EVIL!!! Well I played a Comm in a chinese tournament a while ago who was protoss. Unless there are, as you say, multiple Comm's. In which case I support the retirement of one of them completely for that is just confusing! there was this previous thread, comm considering retirement, i guess its more relevant to translate it now. Goodbye Comm, you will forever be remembered in the Chinese scene as one of the giants that once dominated... just like F91 once did in BW, and Sen in the tw/kr scene in WOL/BW. Man i was really angry when MLG just disqualified Comm for using his friend account when he won the qualifier for Season 1 Premier league. Imagine how much his programmer career could have change if he was at the Season 1 premier for America. The rein of Comm ends time for Jim and Macsed to rise. Simplicidad no es una cosa simple. I think you played with Ash, maybe Ash using Comm's account because they are in same team. Why don't you play other Dota kind games? Because there is no Denies!!!! Comm the WCS China CHAMPION of last year! Now bowing out GL to him! Never forget what MLG's admins did to him in the WCS America Season 1 Premier League qualifiers. Considering this, I don't blame him for retiring. That could have been his one big shot to break WCS and make a name for himself and instead he got crapped on.